Rare to see one that isn't rusted it out. Orange is such a great color on old Japanese cars. Just get rid of those rims, please! ooooooh,I love the coupe version. 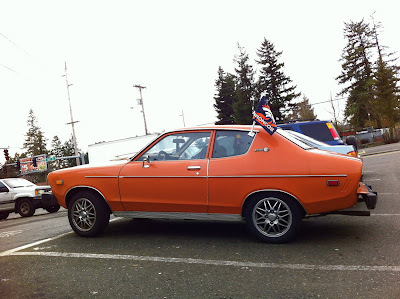 I agree with seattleO, those rims need to go and so do those huge bumpers,jdm unit's will look a whole lot better and make the car look like it's supposed to. I would love to find the owner and see if they would sell it. 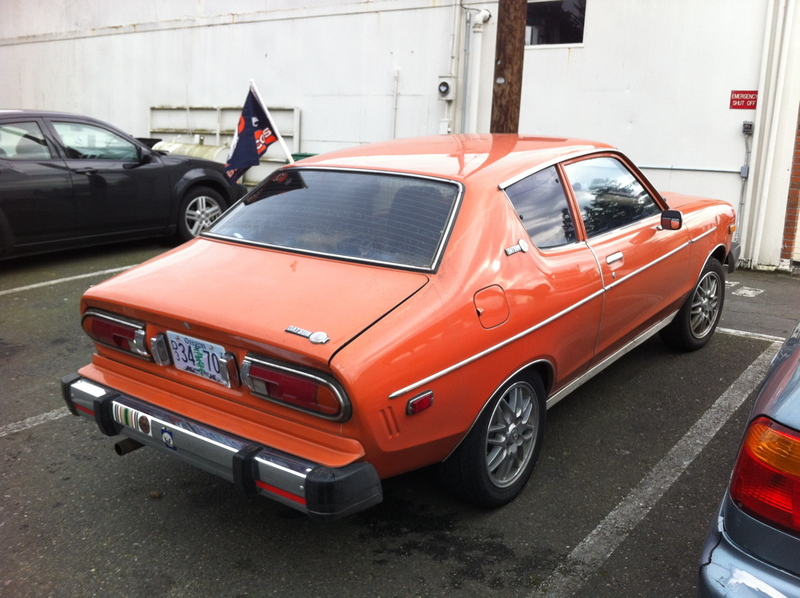 this is one of my dream Datsuns. so much potential in a fantastic looking machine. I had one of these for several years, although it was not in such pristine condition (mine was mustard-colored patched with primer paint). I'm confident that these bumpers are original stock. Rims are not. this is gonna be a long one. anonymous, you're right about the bumpers, america got those huge 5mph bumpers on all the imports during the later half of the 70's as well as different grilles on some cars. on some models you can see where they attached a filler panel to fill the indentation where the original bumpers hugged the body like on the 74 and later mazda rx2 and rx4 or the 78-79 Datsun 200sx,those are just a couple good examples, on this car you can see where they added blocker panels on the top to make the pontoons seem more flush with the body. the ones for the home market or Europe got the original flush body hugging bumpers. 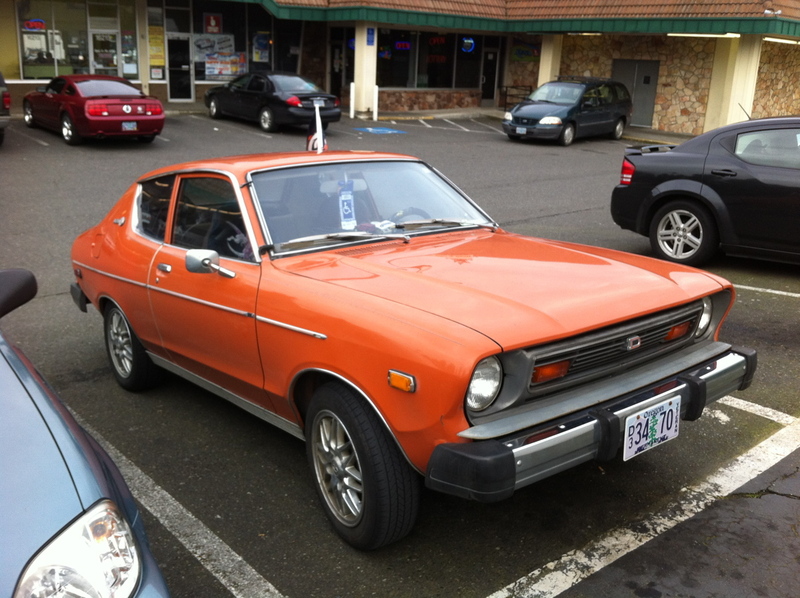 just do a Google search for Datsun sunny 120y or Nissan sunny and you'll see the difference. the fastback b210 for america even got a different taillight treatment than the jdm model, american models had two rectangular lights, the Japanese model as well as other markets had 6 curricular pods on a silver or grey cover panel. they kinda looked like the back end of the 63 corvette grand sport with a few less holes, a very cool rear end they should have kept it for the u.s. market, but I digress. Friggin' epic, and I love what the incline (or simulated incline from your camera) is doing for that stance. I can't imagine a happier color on a small car. Grill indicators tag. Wow, I am totally floored this car has gotten so much praise! I purchased this car in 2006 while us was stationed in 29 palms, CA. from a tiny dealership just outside of town. You guys hate on the wheels all you want it actually had 20" rims on it when I bought it that we're hideous and would rub horribly. I had a friend that drove a small Infiniti that also had the same lug configuration so we swapped rims. I drove it all over Southern California until my mother mentioned she needed a vehicle and she has had it in her nurturing care ever since. When I got it the only flaws were the paint was a little oxidized, the clips for the sun visors had dry rotted and cracked and the left horn button dried and cracked as well. My mother had one issue with the drive train (differential I think) but other than that it runs like no other, shines like glass, and has more personality than most people I know. It will be making its way back into my hands some day! I had a green one while stationed at Camp Pendleton. Got loaned to a "friend" in another company at Las Flores and went awol. He did return it with a blown head gasket and burnt up clutch. I repaired these and the "friend" got into no trouble for turning 1 day into 27. It was stolen again and left on the roadside so I threw my hands up and it was towed somewhere and I never saw it again. I drove it across the United States. Great little car. Looking for 1 for my kids to use. Thanks for the memories.